Situational awareness: The White House this morning announced nothing new regarding U.S. tech exports when discussing investment restrictions on China and other countries, although there are some export controls in a bipartisan bill that President Trump is expected to endorse, Axios' Dan Primack reports. One proud thing: We’re celebrating as Axios was named “Best Digital News Start-up” at the 2018 North American Media Awards! Big thanks to all of you, who make this work possible. 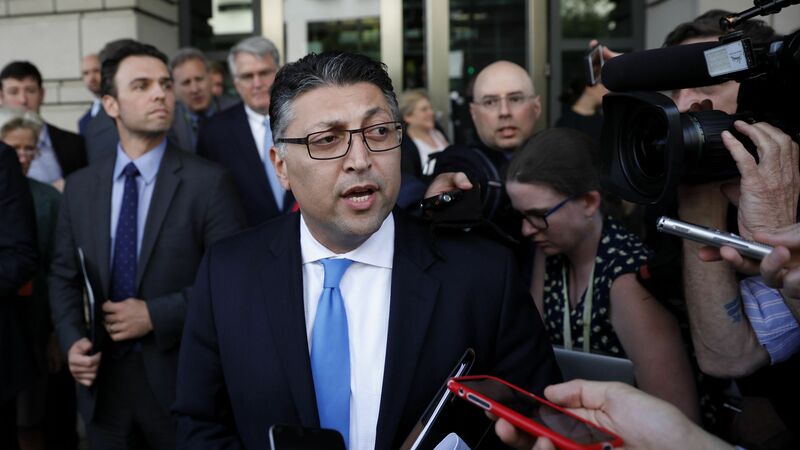 Makan Delrahim, the top antitrust cop in the U.S., said Tuesday he's not concerned that a Supreme Court ruling this week will hurt the government's ability to rein in Big Tech. But, that doesn't mean he's ready to take action against any or all of the major tech firms. "Just being big is not bad," he said during an on-stage interview at the Aspen Ideas Festival. "Being big, behaving badly is bad." The standard: In order to take action, the Department of Justice must see proof of actual harm to competition, Delrahim said. The context: Critics of large tech companies worry the SCOTUS ruling might offer Silicon Valley companies like Google, Facebook, Amazon and Uber protection from antitrust prosecution because they use so-called two-sided marketplaces to connect parties (such as buyers and sellers). What he's saying: Responding to a question from Axios, Delrahim said he didn't think the ruling would make it harder to go after Facebook and Google over competition concerns "for a couple of reasons." First, he said, each case is specific to the facts. Second, the ruling doesn't treat all two-sided marketplaces alike. While it might help protect Uber and Airbnb, which directly connect two parties, Delrahim said he wasn't sure that Google and Facebook would see their businesses similarly affected. "I was more worried the Supreme Court would come up with a test [that would] cause harm to new business models like Uber and Airbnb." Two hats: Delrahim was also on the spot as a de facto representative of the Trump administration (the left-leaning event didn't have an easy time landing speakers from the administration). Asked how he felt to be a part of this administration as an immigrant, Delrahim said he was "proud to be serving in this or any capacity." He didn't speak directly on the immigrant detention issue, saying "people will have different views" and shifted the discussion to a lack of civil discourse. "People run into their corners," he said, noting that there is little room for moderates in today's politics, or to find common ground. "There seems not to be a debate to understand each other. I wish there was more of that." Despite all the hype and attention that next-generation cellular networks have garnered, there are many carriers around the world that are still unsure of the business value of 5G, at least in the short term. What's happening: That's the gist of a new report being released today by Bain & Co. The consulting firm cited public statements from more than half of 19 major carriers indicating they don't see a near-term business case for 5G. Other myths: Many carriers around the globe fear that they have to dramatically increase their capital spending in order to invest in 5G. But Bain's Herbert Blum tells Axios that's just one of several myths. "It will not taper off," he said, of capital spending. "It will also not explode." Blum said the other misconception is that the eventual benefit of 5G lies more in cutting the cost to deliver each bit versus generating revenue from new areas. Risk of standing still: The real danger is for those carriers who choose to delay spending. "That would be the beginning of the (total) commoditization of telcos," he said. Yes, but: The pessimism Bain is seeing in some parts of the globe is all but absent in China and in the U.S. where major carriers are racing to be first with a mobile 5G network. IBM plans to release more than 1 million facial images to help better train the artificial intelligence behind facial recognition systems, Axios' Kim Hart reports. Why it matters: The risk of bias being built into AI systems is a major hurdle for all companies developing facial analysis algorithms to, for example, recognize different skin colors and other attributes in a non-discriminatory way. Since AI is only as good as the data that trains it, IBM thinks making a diverse dataset available will help root out bias. How it works: IBM says its new project will be the largest facial image dataset available that is specifically curated for the training of AI, and will be open to academics, public interest groups and competitors. IBM selected a sampled subset of one million images from Yahoo's Flickr dataset (Flickr allows the use of its images for research). Its researchers have been annotating those images with facial attributes (such as hair color and facial hair) for more advanced matching capabilities, and they used geo-tags to get an appropriate mix of data from multiple countries. IBM is also releasing a dataset of 36,000 facial images that are equally distributed across all ethnicities, genders and ages to provide a more diverse dataset for researches to use to identify and correct bias in their facial analysis systems. "No single company can tackle the challenge of AI bias in a vacuum, and we believe it’s essential that tools like this be available for everyone in the field so we all can play a role in advancing the technology responsibly." The challenge: AI technologies are developing quickly, but consumers are wary of the consequences. At the same time, consumers are becoming more aware of the power of their data — including photos and videos — being collected by tech giants to build AI systems. For months, IBM has been pushing responsible technology development, making the case that losing consumer trust in the early days of AI will undermine the broader benefits the tech industry thinks AI can offer. Of course, loss of consumer trust is also bad for business. Silicon Valley is still king when it comes to startups, but Chinese cities like Beijing and Shanghai are quickly catching up, according to new data from CB Insights. Beijing startups raised more than half as much funding as Silicon Valley between Jan. 2012 and May 2018, and twice as much as New York companies. Why it matters: China is a huge market, so it's not surprise its local startups are fast growing and raising buckets of capital to fuel that. But the country's increasing ambitions to become a tech superpower is sure to boost this trend. Go deeper: Axios' Kia Kokalitcheva has more here. "I finally figured out why they call it Fortnite. That’s how often I see my kid." Spotify hired Conde Nast entertainment president Dawn Ostroff as chief content officer. Stitch Fix CEO Katrina Lake has joined the board of beauty startup Glossier. Elmo served as guest host of HQ yesterday, though he has yet to land the gig permanently. If California legislators don't pass a tough new privacy bill by Thursday, an even stricter proposal will be placed on the November ballot, per Gizmodo. Facebook says it's scrapping plans to build its own internet-delivering drones and will close a facility in the U.K. In cryptocurrency news, Facebook has partially relaxed its ban on cryptocurrency ads, while Florida's CFO wants to hire a cryptocurrency chief. Apple released a public beta of MacOS Mojave, a day after offering a similar test version of iOS 12. Qualcomm introduced new chips for mid-range phones, according to The Verge. One of my favorite authors, Jenny Lawson, announced she is working on two books: a new collection of essays and a graphic novel for young adults.